Lawyers Didem Ünsal, Aytaç Ünsal, Ahmet Mandacı, Yağmur Ereren, Barkın Timtik, Ebru Timtik, Şükriye Erden, Engin Gökoğlu, Ezgi Çakır, Süleyman Gökten, Ozgur Yılmaz, Oya Aslan, Ayşegül Çağatay, Behiç Aşçı, Aycan Çiçek, Günay Dağ, Zehra Özdemir, Özgür Yılmaz who are the members of People’s Law Office (Halkın Hukuk Bürosu) and Umut Law Office were taken into custody with police raid this morning (12/9/2017). With this last wave of crackdown against lawyers, number of lawyers under criminal prosecution raised to 1343; 524 of them have been arrested. Lawyer Ozgur YILMAZ who is member of Umut Law Office, was taken into custody with torture in Istanbul. The 18 lawyers taken into custody have been representing the arrested hunger strike activists Nuriye Gulmen and Semih Ozakca. Gulmen and Ozakca who were arrested on 23rd May 2017, will be on trial in Ankara two days later. Nuriye Gulmen and Semih Ozakca have started a hunger strike after got dismissed with a emergency decree and are on hunger strike for more than 180 days. They were arrested on 23rd May 2017 to prevent growing interest of the public about their hunger strike. 18 lawyers taken into custody would represent them on the hearing dated 14th September 2017. The European Court of Human Rights rejected the request regarding to rule to release of Gulmen and Ozakca on 2nd August 2017. The ECHR ruled that the detention of academic Gulmen and primary school teacher Semih Ozakca “did not pose a real and imminent risk of irreparable harm to the life of the applicants” and also urged them to end the hunger strike and trust the Turkish state. 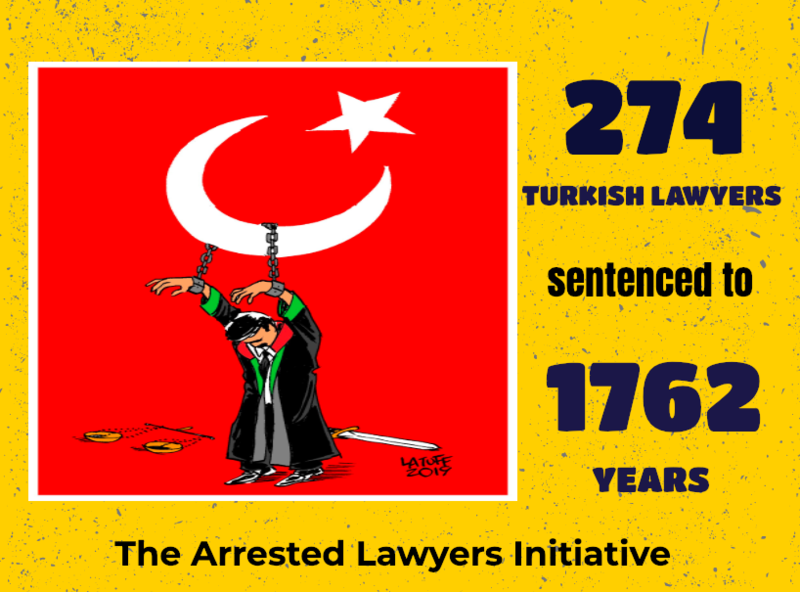 As of 12th September 2017, 524 lawyers have been arrested (since 15th July 2016) and 1343 lawyers are under prosecution. Some of the arrested lawyers were subjected torture and ill-treatment.